The Minnesota Department of Corrections is nationally renowned for maintaining secure, humane, and largely non-violent correctional facilities. Through collaboration with lawmakers, communities, staff, and inmates, the state has a long record of efficient care and low rates of recidivism for incarcerated offenders. Given the growth that is occurring at county and state levels, the state has mounted an active recruiting campaign that spans all ten of the state's correctional facilities. Forecasted over the next 10 years, the industry is expected to grow from 4,208 male and female frontline correctional officers to 4,418 officers. In addition to new growth, recruitment efforts will also target vacancies through retirement, career moves and advancements. As part of the state's mandate articulates that it is imperative to provide inmates with educational opportunities, treatment for substance and mental health problems, as well as job training, the nature of the correctional officer role is changing and developing. If you're interested in reading more about this dynamic career opportunity in Minnesota, scroll down for more information. 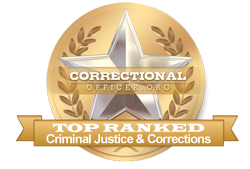 Fond du Lac Tribal and Community College ranks 1st in our latest rankings with 117 students graduating from programs in criminal justice out of a total 788 students in the 2012-2013 school year. Alexandria Technical & Community College ranks second in our latest rankings with 279 students completing programs in criminal justice out of a total a thousand graduates in the 2012-2013 school year. Hennepin Technical College ranks 3rd in our rankings with 234 students completing programs in criminal justice out of a total three thousand students in the 2012-2013 school year. Hibbing Community College ranks 4th in our rankings with forty-three students graduating from programs in criminal justice out of a total 730 graduates. Metropolitan State University ranks 5th in our latest rankings with 237 students completing programs in criminal justice and criminal justice out of a total 4,408 graduates from the 2012-2013 school year. Vermilion Community College ranks 6th in our latest rankings with fifteen students graduating from programs in criminal justice out of a total 346 students from the 2012-2013 school year. Inver Hills Community College ranks seventh in our rankings with 83 students completing programs in criminal justice and criminal justice out of a total 1,938 students. Bemidji State University ranks 8th in our rankings with seventy-four students completing programs in criminal justice out of a total 2,304 graduates in the 2012-2013 school year. North Hennepin Community College ranks ninth in our latest rankings with 89 students completing programs in criminal justice and criminal justice out of a total 2,822 students from the 2012-2013 school year. Concordia University-Saint Paul ranks 10th in our rankings with fifty-three students graduating from programs in law enforcement administration and criminal justice out of a total a thousand students from the 2012-2013 school year. Candidates who have passed the assessments will be offered an opportunity to attend basic correctional officer training wherein the curriculum is designed to teach candidates the policies and procedures of the Minnesota DOC, with an emphasis on a hands-on approach and situational analysis. Only candidates who pass basic training will be considered ready for a position. The state of Minnesota is committed to serve and support correctional facilities in the state by encouraging growth in the field. To this end, the median income for front-line correctional officers throughout the state is somewhat higher at $46,400 than the median national income of $39,800. CareerInfoNet.org has published state and national trends at http://www.careerinfonet.org/occ_rep.asp?next=occ_rep&Level=&optstatus=011000000&jobfam=33&id=1&nodeid=2&soccode=333012&menuMode=&stfips=27&x=48&y=14 which predict that growth in Minnesota at 1% from now until 2022. This predicted rate of growth translates into approximately 140 jobs in the form of newly created openings and existing vacancies over the next decade. The table below lists career information obtained from the BLS for correctional officers in Minnesota. The table is sorted by total employment, with the largest metropolitan areas listed first.